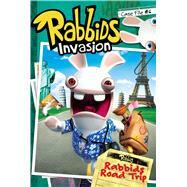 by Lewman, David; Johnson, Shane L.
Agent Glyker has been trying to catch a Rabbid ever since he joined the SGAII-RD (Secret Government Agency for the Investigation of Intruders—Rabbid Division), but his last encounter with the Rabbids has left him in deep trouble—and on administrative leave. With his entire career hanging in the balance, Glyker knows the only way to save his job would be to finally catch a Rabbid…no matter what it takes. When a popular reality show, The Astonishing Trek, comes to town and the Rabbids are drawn out of hiding, Glyker thinks he’s hit the jackpot! But if he wants to follow the Rabbids, who are following the contestants of the show, he’ll have to travel all over the world. Can Glyker finally succeed at catching the Rabbids? Can he even afford the plane ticket?